The $201.4-billion plan, which takes effect next week, is the final budget of Brown’s eight-year tenure. It is also the third consecutive blueprint that includes notably higher-than-expected tax revenue, a sizable portion of which lawmakers are diverting into the largest cash reserve in California history. Lawmakers sent Brown the budget last week, and he chose to sign it Wednesday without any line-item vetoes — unusual in comparison to previous governors, but consistent with his recent budget actions. ..
Democratic Gov. Jerry Brown proposed a $131.7 billion state spending plan Wednesday, launching his final year of budget negotiations as he prepares to leave office. Brown’s proposal is up 5 percent from last year but includes little new spending on new programs. Once again warning that he believes a recession looms, Brown dedicated $5 billion toward the state’s Rainy Day fund, more than is constitutionally required. He also proposed a new online community college program. “It’s not exciting, it’s not funding good and nice things, but it’s getting ready and that is the work of a budget,” Brown said. Notably, Brown’s plan makes no changes related to federal tax changes out of Washington, which are expected to hit taxpayers in high-tax states like California the hardest. That’s because Brown had to finalize his plan in December, before the federal changes were finalized. He said he expects to make revisions to his plan during ongoing negotiations with the Legislature. A final plan must be passed by lawmakers in June. Governor Jerry Brown and his Finance Department are putting finishing touches on his final budget to be presented soon. This is a second time that Brown has wrapped up two terms as Governor of California offering a final budget. While much has changed in California government, politics and demography since that “first” last budget in 1982 was completed, a look back may offer some hints on where Brown will go with his second final budget. Brown’s budget will reflect California’s current circumstances of a big economy with surpluses into the near future. The Legislative Analyst’s Office projected in November $19.3 billion in reserves for the 2018-19 budget if the legislature doesn’t create new budget commitments. Brown will do his best to keep those commitments in check. But much can happen in the next few months to affect the budget Brown plans to present. Decisions out of Washington, D.C. on health care and the federal tax law changes, and also a possible repeal of California’s gas tax may upset any near-term picture on the budget. One key difference from 36 years ago was that California was still living in the shadow of the tax revolt of 1978. Another key difference, while no longer running for governor, Brown would be on the 1982 ballot as a candidate for United States Senator. Recently, California legislators and voters have loosened their grip on the purse strings in recent legislative terms and elections. This time around Brown is not seeking another office and political considerations will not cloud budget decisions. Ironically, just like the end of Brown’s current term, the year prior to his final budget the gas tax was increased in California. In 1981, the gas tax was raised two cents from 7-cents to 9-cents, a 28% increase. In 2017, the gas tax rose 12-cents from 29.7-cents to 41.7-cents, a 40% increase. Brown was still famously speaking about the “era of limits” when he signed the $25.3 billion 1982 budget on June 30. The budget he offered in 1982 came at a time a recession hit. Brown’s 1982 budget was barely 1-percent larger than the previous budget. Brown had an eye on his senate race and didn’t want to offer ammunition to political opponents. Reserves in certain accounts were tapped and gimmicks employed to make the budget appear balanced. It wasn’t. By the close of 1982 the budget was nearly $1 billion out of balance and the Senate Finance Committee held several hearings to come up with a fix. The trend of inheriting a deficit was certainly felt by Brown when he took office for his third term in 2011. He does not want to leave a deficit again. His personal history from his first tour in the governor’s office and the experience of his recent gubernatorial journey will have him focused on the budget bottom line to maintain the surplus that the LAO projects. Legislators should put their spending plans back in their pockets. These new taxes have attracted a lot of attention, but in reality California’s state government derives most of its tax revenue, 58%, from personal income tax. In recent years personal income taxes have contributed as much as 65% of the California state government’s total tax revenue. California’s top marginal income tax rate of 13.3% is by far the highest in the U.S. Oregon has the 2nd highest rate, at a much lower 9.9%. The impact of this can be seen on the chart depicted below, which is taken from the State Controller’s most recent annual financial report for the fiscal year ended June 30, 2016. As can be seen, state income taxes accounted for 58% of all tax revenue in the most recent fiscal year for which we have data. Nothing else even came close. When around 60% (or more) of all state tax collections depend on how much money individual residents make each year, revenue can be volatile. A recent analysis by the Franchise Tax Board, as reported in the Sacramento Bee, showed that the top 1% of California taxpayers by income paid 45% of the total income taxes collected. This means that in the last fiscal year, the top 1% paid 26% of ALL taxes collected in the State of California. If you extend that comparison to the top fifth – those Californians who earned on average over $237K in 2013, it can be seen they paid nearly 90% of the total income taxes collected, or 51% of ALL taxes from all sources. When you have the top fifth of your wage earners paying more than half of ALL taxes collected in your state, you definitely don’t want those folks moving to other states. California has really great weather, but there are a lot of reasons to leave: An inhospitable business climate, a global economy with burgeoning new opportunities in many low tax regions, and an increasingly virtual work environment which means you don’t have to live within 50 miles of the California coast in order to attract venture capital or find business partners. Just for the sake of argument, here are ways to cut expenses in the state budget, in order to keep California’s state government solvent without punishing the wealthy, or, worse, losing them to other states and nations. (1) Reduce Costs for Prisons – $2.0 billion or more: California now spends over $75,000 per year per prisoner, a cost that has doubled since 2005. In Alabama, it costs less than $15,000 per year per prisoner. If California contracted with the State of Alabama to have them house its 130,000 prisoners, that would save California taxpayers $7.8 billion per year. If doing business with Alabama is unpalatable, how about right across the border in Nevada? The State of Nevada spends under $18,000 per year to house their prisoners – sending California’s prisoners across the Sierras to Nevada could save taxpayers $7.4 billion. Obviously relocating California’s prisoners to other states is an extreme solution. But there are many other less extreme, bipartisan solutions to lower prison costs, including alternatives to incarceration. (3) Outsource CalTrans Work and Eliminate Redundant Positions – $2.5 billion or more: CalTrans is set to consume $12.8 billion of the State 2017-18 budget. As recommended by State Senator John Moorlach after an audit of the agency, just eliminating 3,500 redundant positions would save $500 million. But competitive outsourcing of roadwork contracts could save much more. CalTrans only outsources 10% of its roadwork, whereas, for example, Arizona outsources 80% of their roadwork. It is common to take competitive bids from private contractors to do public road maintenance and upgrades – CalTrans is the exception. A very expensive exception. (4) Fund all CalTrans Work With Proceeds from Bullet Train Financing – another $10 billion per year for ten years: Ok, this isn’t entirely fair. Bonds are deferred taxes. But just imagine if instead of paying for a train that will never make any meaningful contribution whatsoever to relieving the congestion on California’s roads and freeways, all that money was used to improve the roads? Redirecting Bullet Train funds – which are destined to total well in excess of $100 billion – into CalTrans projects would save taxpayers nearly 100% of CalTrans budget for a decade or more. (5) Slash State Agency Headcount and Pay/Benefits by 20% – $6.5 billion: In 2015 the average pay and benefits for the 154,000 full time employees of state agencies was $116,887. Eliminating 20% of these jobs would save taxpayers $3.6 billion per year. Reducing pay and benefits for the 123,000 remaining state employees by 20% would save another $2.9 billion – their average pay package would “only” be $93,500 per year after this reduction. Is this feasible? Recent history proves that it is. In 2009, cash-strapped California state agencies implemented “Furlough Fridays,” which functionally achieved both objectives described here – there was a 20% reduction in work being performed, and state workers collected 20% less in pay. And guess what? The state government continued to function. (6) Reform Pensions – $2.1 billion: When you talk about pensions, it is understating the problem to restrict the discussion to state agencies. 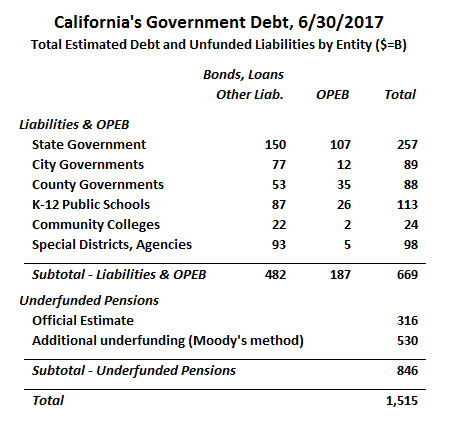 Local cities, counties and school district pensions combine with state agencies to produce an unfunded liability that – depending on who you ask – ranges between $200 and $700 billion. Moreover, pension reform might be subsumed under the preceding Option #5. Nonetheless, here are the numbers for state agencies: Taxpayers contribute, on average, $21,900 towards each state workers pension, representing 26% of their pay. Just lowering that to a contributory 401K equivalent to 10% of pay would save at least $2.1 billion per year. In reality, because these pensions are so underfunded, getting control of pension benefits would actually save much more than this estimate. (7) Face Reality and End the “Sanctuary State” – around $20 billion: According to the United Nations, there are now over 250 million displaced refugees in the world. Right behind them are another 1.2 billion individuals living in extreme poverty. America, with only $330 million residents, is not nearly capable of absorbing even a fraction of these multitudes, much less California with not quite 40 million residents. Yet California has thrown open the doors and foots the bill, betting that the tech boom and asset bubble will last forever. A study by the Federation for American Immigration Reform estimated the cost of undocumented immigrants to California taxpayers at over $25 billion per year – $14.4 billion for education, $4.0 billion for health care, $4.4 billion for justice and law enforcement, $0.8 billion for public assistance, and $1.6 billion for general government services. This scrupulously footnoted study, published in Sept. 2017, got virtually no coverage in the media. What did receive extensive media coverage was a study promoted by the Institute on Taxation and Economic Policy that estimated the total state and local taxes paid by California’s illegal immigrants to equal nearly $3.0 billion per year. Net cost and potential savings: $22 billion. At the least, California should stop being a magnet state for undocumented immigrants, and instead should help craft then adhere to a realistic national policy. The most powerful special interest in California, government unions, wants nothing to change. They are hostile towards corporations and individual wealth. They have strong incentives to want inefficient, expensive prisons, universities, and infrastructure projects. They have strong incentives to expand all government services to accommodate destitute immigrants. Why? Because the more government workers are hired and the more taxpayers’ money is wasted, the more dues paying government union members they acquire. Joining these government unions are California’s powerful Latino Legislative Caucus and their allies in the identity politics industry, who recognize a huge political opportunity by spewing separatist demagoguery, nurturing a bleak, tribal paranoia in the collective minds of recently arrived immigrants. Also joining these government unions are left-wing oligarchs and the monopolistic businesses they control, who see in an expanded government and a hostile business climate a chance to prosper through legislated scarcity and mandated product choices. And, of course, the asset bubbles produced by contrived shortages add precarious value to the pension funds and increase property taxes. So these solutions, while eminently practical, may never see the light of day. But California’s voters should understand that around $40 billion could be cut from the state budget if California’s government was ran in the interests of the people, instead of in the interests of government unions and their elitist allies. If $40 billion were cut from California’s state budget, not only could the new gas tax be repealed, but the top marginal tax rate could be dropped to under 10%. And as any student of the Laffer Curve knows, that might actually keep California’s wealthy from leaving; it might even cause income tax revenue to go UP, as fewer high income individuals feel the need to shelter or defer their taxable earnings. Depending on where you are on the curve, lowering taxes can raise tax revenue. Edward Ring is a contributing editor for the California Policy Center.